Batyrma is a flavorful dish that comprises summer’s best vegetables, which is why it’s such a popular choice among Turkmens during the summer. 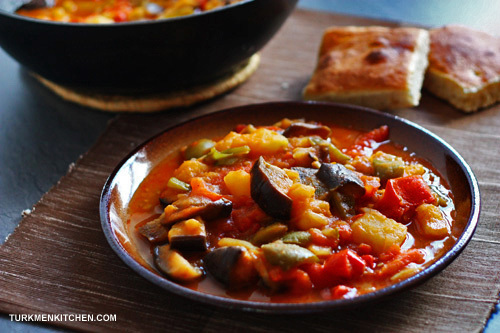 Similar to ratatouille, its key ingredients are ripe tomatoes, bell peppers, eggplant and onion. The name of the dish comes from the Turkmen word batyrmak, which means “to dip”. As the name suggests, you eat batyrma by dipping chunks of bread into the stew. Heat the oil in a large pan or wok over medium heat. Add the onion. When the onion begins to soften, add the bell peppers, eggplant and potatoes. Stir and fry for 5 minutes. Stir in the tomatoes, garlic, salt and pepper flakes. Cover the pan with the lid and cook until the vegetables are tender, about 20 minutes. Serve hot with bread. Feel free to omit the potatoes or add other ingredients, such as zucchini, eggs, meat or gowurdak.